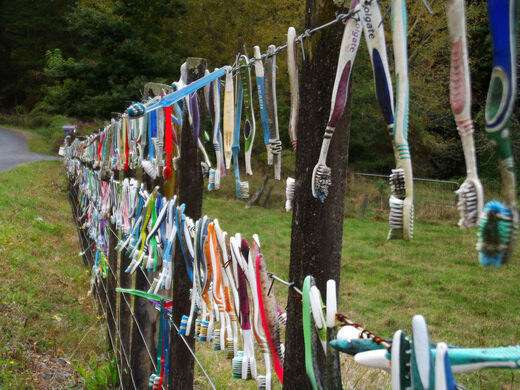 Hundreds of toothbrushes hang from a wire fence along a quiet New Zealand road. 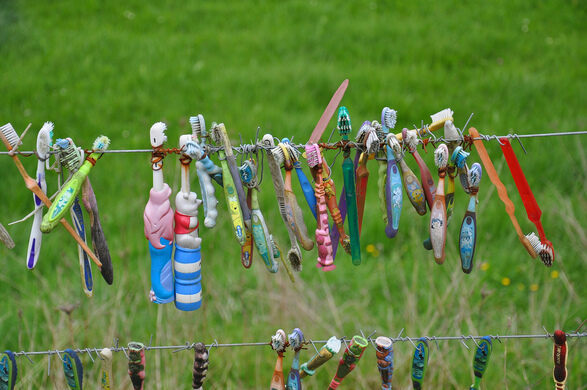 In 2006, local eccentric Graeme Cairns began hanging toothbrushes from a fence along a quiet rural road that runs through the green and rolling landscapes near Te Pahu, New Zealand. Friends and neighbors joined in the fun, and soon even the Prime Minister of New Zealand had her toothbrush hanging in the wind alongside hundreds more. It’s safe to say that Graeme Cairns is an unconventional man. As the self-proclaimed Laird of Hamilton, a member of the McGillicuddy Serious Party, and a member of the Big Muffin Serious Band, he’s definitely pushed the boundaries of staid normality. So too with his 2006 project: the creation of a toothbrush-strewn fence in the heart of cow country about 12 miles from Hamilton, New Zealand. So he strung up his collection along the fence, and the locals thought “Well, why not?” Soon there were 50 more toothbrushes along the roadside. Not only toothbrushes, but kitchen brushes, electric toothbrushes, and a toilet brush were added. Toothbrushes have since been left by domestic and foreign tourists, as well as a handful of celebrities, most notably New Zealand’s former Prime Minister Helen Clark. In 2014, a five-meter section of the toothbrush fence was torn up when a car lost control during a high-speed police chase. The fleeing suspect plowed into the fence, uprooting it and the hundreds of toothbrushes innocently hanging from its horizontal wires. The community soon rallied around, however, and the toothbrush fence was returned to its former glory within a week. 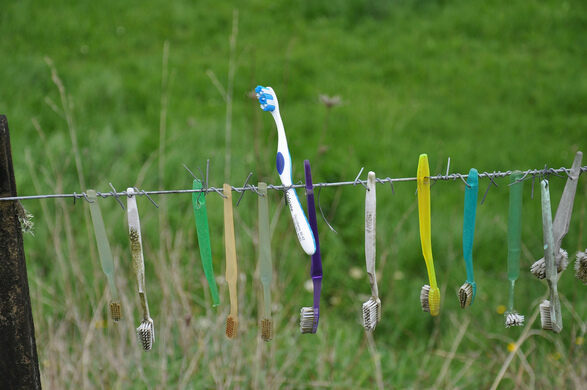 The toothbrush fence is located along Limeworks Loop Road, Te Pahu, near Hamilton, New Zealand. Don’t forget your toothbrush so you can hang it up with the rest. One man's dream has turned into this naturally growing chapel made of almost nothing but trees. A steampunk airship "floats" above Hamilton Gardens delivering plants and compost.